The French label Alpha Classics has begun a series of reissues of Baroque music, which it calls the ‘Essential Baroque Masterpieces’ collection. The booklet lists fourteen releases, two of which are considered here. A number of others in the series have already reviewed (see the 300 series in the Alpha index). The disc containing the ‘Four Seasons’ was originally released on Zig Zag Territoires (ZZT080803) and is still available, but at a significantly higher price. The sonatas disc was an early Alpha release (Alpha004), no longer available. My first encounter with Amandine Beyer and Gli Incogniti was a Couperin disc earlier this year (review), and I remarked that it took a number of listens to accustom my ear to their strident tone. This time, the acclimatisation took one track or less, and I found myself enjoying the first two concertos on the disc, both of which received their first recording on the original release. The main works are the Four Seasons concertos, and here Beyer and Gli Incogniti compete with literally hundreds of recordings. If you are reading this, then you will almost certainly have your favourite version: mine is by Europa Galante and Fabio Biondi. They are known for their flamboyancy and occasional excesses in terms of tempo, but for me, they are perfect for Vivaldi. Equally, they have disappointed me in Telemann and Corelli. I saw them perform the four concertos in the Sheldonian Theatre in Oxford: it remains one of the most astonishing live performances of anything I have ever seen. Such was the impression made that I have felt little need to explore further recordings, but when this came up on the list of CDs to review, I remembered the good impression made by Beyer et al. on the Couperin disc and requested it. I’m disappointed to report a very mixed response, which ranged from very good to just wrong. Overall, the tempos are quite fast, more than a minute quicker in Winter and one and a half minutes in Summer, compared to Europa Galante. Spring and Autumn are good, the two finales really outstanding in their dance rhythms. The Summer storm, so intense with Biondi, is more a heavy shower here. My favourite movement of all is the Largo of Winter, and this performance is just wrong as far as I’m concerned. For no obvious reason, they adopt a tempo close to allegro, so far away from Europa Galante’s biting and brittle version that I felt I needed to check whether I had the wrong definition of largo – I hadn’t. 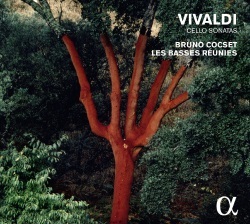 I found that these were my first exposure to Vivaldi’s cello sonatas, and they certainly reveal a darker, more restrained side to the Red Priest. 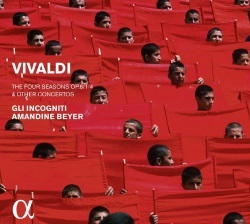 Those expecting the usual Vivaldi fireworks exhibited by his concertos will find this a quite different experience: less colour, more introspection. My pick is the B flat major RV47, which has the greatest variety in moods. At times in the faster movements, I thought a little more variety in dynamics would have helped, and I concluded that these were works better listened to individually, rather than as a set. Bruno Cocset and his three colleagues play period instruments, but their approach to historically informed practice is much less extreme than Amandine Beyer and Gli Incogniti. Throughout this series, the packaging is a cardboard foldout double sleeve, which is either more environmentally friendly than plastic cases or cheaper, or perhaps both. However, it makes removing the disc a challenge, and you cannot avoid putting at least one greasy fingerprint on the playing surface. If you store your CDs like books, then the very narrow spine and exceedingly small print will make the disc difficult to find again. Another common feature is the booklet notes which are “interviews” with the main performers about the works and their performance practices. Given the well-known nature of most of the works, I think this is an intelligent alternative to simply regurgitating the standard information. In both cases, the sound quality is very fine. Reissues are always a little hard to categorise given that many will already have bought or chosen not to purchase the original release. Both of these have their virtues, as well as their downsides.